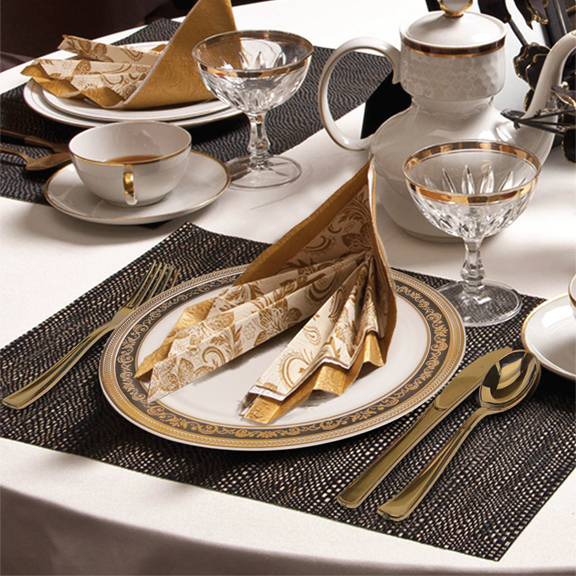 Décorline is a global designer and manufacturer of super premium disposable place settings, barware and serveware. Since 2001, we have been the provider of choice for retail home stores, foodservice companies, catering companies and party vendors. Since 2001, we have been the provider of choice for retail home stores, foodservice companies, catering companies and party vendors. Catering and party trends change fast. We adapt by offering fresh, new product lines to surprise and delight your customers and their guests. Experience the discovery of beautiful new offerings every so often and enjoy a product line that evolves with you. With beautiful visual themes, our collections tell stories. Effortlessly weave them into agorgeous narrative, evoking old world charm or ultra-modern chic. That’s how you give your customers exactly what they want, every time. Thanks to exacting quality control measures in both our European and Chinese manufacturing corridors, we’ve established a reputation for never shipping any product that isn’t up to par in all the 15 years we’ve been in business. We believe in keeping special occasions special while adapting to the realities of an increasingly hectic world. With an inspired, evolving catalog, each event can be a truly unique experience. Best of all, easy cleanup and elegance can be seated side by side.